I think "frijoles" should be renamed "free-holies", because they taste like divinity! The last several months have been rather trying, to say the least. Fortunately, I have incredible friends, both here in Ireland and online. They have given me hugs, offered words of encouragement, lent a patient ear, bought me groceries, and one even recently paid for a ticket so that I could attend the World Travel Market in London next month. Incredible! I have a friend with whom I frequently make all kinds of facetious plans. They sound good on paper, but we both smirk a little when we make our proclamations. "One day we're going to go whale watching!" we say. "Yeah, and when are we going to visit that little museum down in the park? I always get there when it's closed." "We need to make Mexican food one of these nights, too!" …and several other things that seem like a good idea at the time. Still, there was one day last week that I suspected would be particularly trying, so I contacted her in advance. "You know that tortilla press you never use…?" She located a store that sold pinto beans in Cork – a rather new occurrence, really – and happened to have a ripe avocado. She had dried masa from the US and several kinds of peppers, too. And of course, there was the all important tortilla press. The beans were in the pressure cooker when I arrived, though I did look up the final steps on A Mexican Cook in Ireland to confirm. I had met the author, Lily, at a blogger conference in 2011 and was delighted to find that someone in Ireland cared about Mexican food. It's one thing that most American expats I know miss above all else when living abroad. You can get burgers and drinks and chocolate (of varying quality) overseas, but despite the simplicity of the ingredients, Mexican food doesn't seem to ocean hop as well as other cuisines. I made the guacamole and she made, well, everything else: rice, tortillas, frijoles, salsa, grated cheese, and ground beef. I nearly squealed in delight when I saw the oval plates. I think I actually clapped when she heated them in the oven before serving. "Careful, hot plate!" I felt like I was back in California. Comfort food often consists of things like mashed potatoes or ice cream. And while I will admit to having curled up with more than one bowl of each in my time, my comfort food of choice is Mexican. It genuinely touches something in my soul and just feels safe, warm, and loving. It's my all time favorite and I'm truly grateful for yet another amazing friend. And her tortilla press. I adore Mexican food, and it’s impossible to find a decent version of it here in Argentina (unless it comes out of my kitchen, that is). Plus, Argentines have a severe aversion to anything spicy. Thank goodness I like to cook, or else I’d be in major withdrawal! Oh Mexican food is so delicious. It’s impossible to get good Mexican food in New Zealand. I find it very comforting too. Mmm this post is making my mouth water. Mexican food is seriously good and there are so many combinations. I am off to make a chillie now ;)! I just spent 4 months in Bali with my husband, and the number one type of food we missed was MEXICAN!!! That, besides Italian food, is the best comfort food (and it’s cheap,too). Luckily, our American expat friends introduced us to a Mexican restaurant in Ubud…BEST mexican food EVER…in the middle of Bali! The Indonesian owner had spent some time in New Mexico and worked at a Mexican restaurant, so he took some recipes home with him. Now that I think of it, I am craving their tacos……good stuff! Bali, really? Who knew! I will remember that when I finally make it there to seek out this wondrous place in Ubud! Thanks for the tip. Yes! I liked Mexican food before I left to travel. Now that I’ve returned I LOVE it. Ok, will do. But you have to agree to go to Harold’s Chicken with me. Regular half with BBQ sauce and a coke – omg, to DIE for! I totally agree that Mexican food is comfort food — chicken enchiladas in my case. But my top comfort foods are pot roast or chicken pot pie. Makes me feel better just thinking of them. I must admit that a smile crept across my face when I thought of pot roast just now. I take it the menu did have Spanish on it? Because I could just imagine it showing up and having poor German translations of Mexican dishes. Badly translated menus is one of the things that seems consistent no matter where you travel. One of my favorites was a place in Naples that had, “Laugh at the mushrooms” as a featured dish. But we HAD Mexican food on Tenerife! And hey, at least you have all those imports and exports from the Americas passing through, right? …or was that a difference century? 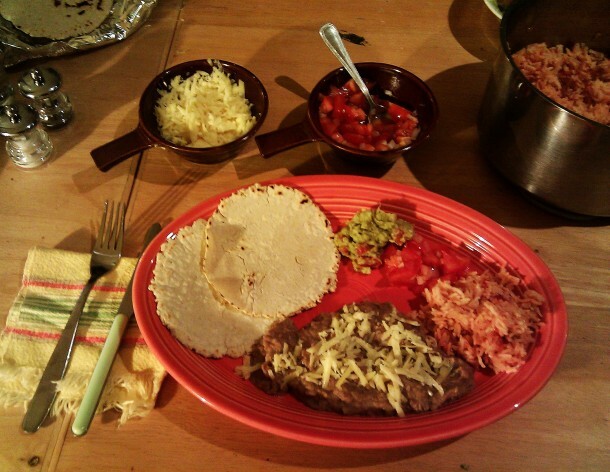 Oh yes, Mexican is comfort food! I can never get enough of it. My pleasure, Ms. E! You rock. Glad we were able to do this. I had a friend from Costa Rica visit me in Rome. She cooked Costa Rican food for me and it, too, was heavenly – mainly because it had so many of the same flavors as Mexican food! Ooo can I come over the next time you make that? Ok, but we’ll need more avocados. And mariachi music. I’m putting you down for those two items. What a lovely post Katrina, it is so true, food makes it all better! My granny used to say, wait for a fine day, it will get to you, so fingers crossed your fine day is just around the corner.